routine and in search of the true Puglia. 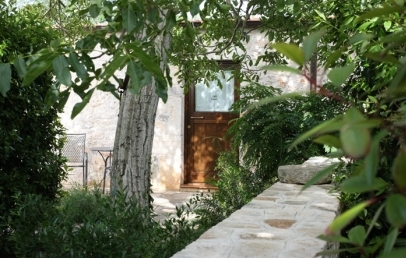 Abate Masseria & Resort is just a few km from the beautiful hamlet of Noci, in the heart of the Valle d’Itria. Its position makes it simple to reach charming Alberobello, Baroque Martina Franca and all the main attractions of the “Valle dei Trulli”. Set amidst secular olive trees and stretches of red earth, Abate Masseria & Resort is a splendid country structure, the outcome of skilful refurbishment. 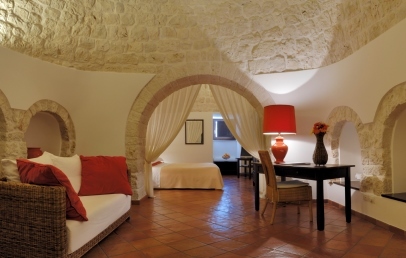 The pointed roofs of the trulli, the old stables and the dry stone walls mark the masseria, which offers its guests a relaxing Mediterranean atmosphere and the warm hospitality of a family-run enterprise. The splendid garden hosts the pool with solarium, a haven of peace and quiet where you can relax in the company of Puglia’s sunshine. Drawn from the trulli and old stables, the 8 rooms of Abate Masseria & Resort are unique in the peaceful atmosphere they offer. The quarry tile of the floors, the white stone of the walls, the wood of the furnishings and the precious materials all go to create an atmosphere which is warm and embracing. In constant touch with the surrounding countryside, all rooms face onto small flowery courtyards or the lush garden hosting the pool. A tennis court and two five-a-side soccer pitches in synthetic grass, also for night-time use, are available to guests, who can take advantage of the equipment and wide spaces surrounding the structure to keep in shape. On request, training is available with a personal trainer or private tennis lessons can be booked. The old stables are home to the Briale, the masseria’s stylish restaurant which has maintained the vaulted ceiling and the old mangers. The restaurant bases its offer on the rich simplicity of peasant culture also in its name, a dialect word meaning the single huge plate placed in the centre of the table, from which all members of the family used to eat. The menu à la carte offers tasty dishes which blend tradition with creativity, bringing to the table the best of the area’s products. The restaurant is closed on Monday and Sunday evening. We suggest you book. The cost of your stay includes free Wi-Fi connection and the use of the pool and other common areas. Guests with payment of a supplement can ensure transfers, push-bike rental, tennis lessons and massages. Welcoming rooms recovered from refurbishment of the old stables. 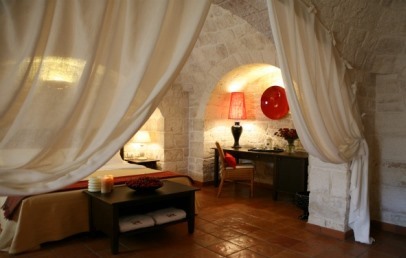 These rooms have stone walls, wooden ceilings and quarry tile floors. All rooms have direct access to a small courtyard (use not exclusive). 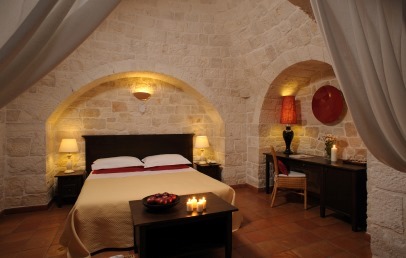 Set in the amazing trulli, these Family accommodations are comfortable and large and host up to 5 people (with crib). The Family Trullo del Mandorlo consists of a double room and a living room (30 m2), a small room with bunk beds (7 m2) and a bathroom (6 m2). The room has direct access to a small courtyard. 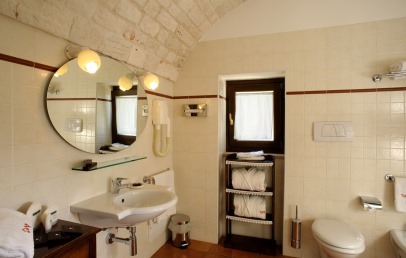 The Family Trullo del Noce consists of a double room plus reading zone (26.50 m2), a small room with two single beds (11 m2) and a bathroom (5.50 m2). The room has direct access to the garden and is close to the pool. 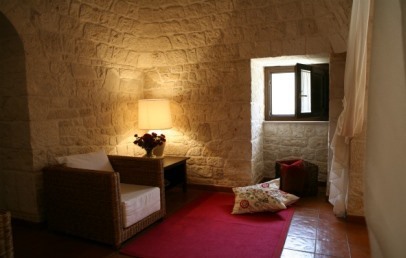 The Junior Suite Trullo del Fragno consists of a double bedroom (17 m2), a lounge area (16 m2) and a bathroom (4.50 m2). The suite is reached from the garden and is near the pool. 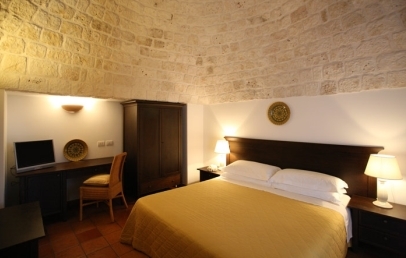 The Junior Suite Trullo del Mandorlo consists of a double room and a lounge area (30 m2), a small bedroom with bunk beds (7 m2) and a bathroom (6 m2). The room has direct access to a small courtyard. A welcoming solution in a more isolated setting, the Trullo dell’Ulivo faces west, overlooking the garden, and guarantees complete peace and quiet. This accommodation solution is also ideal for guests with some form of disability.